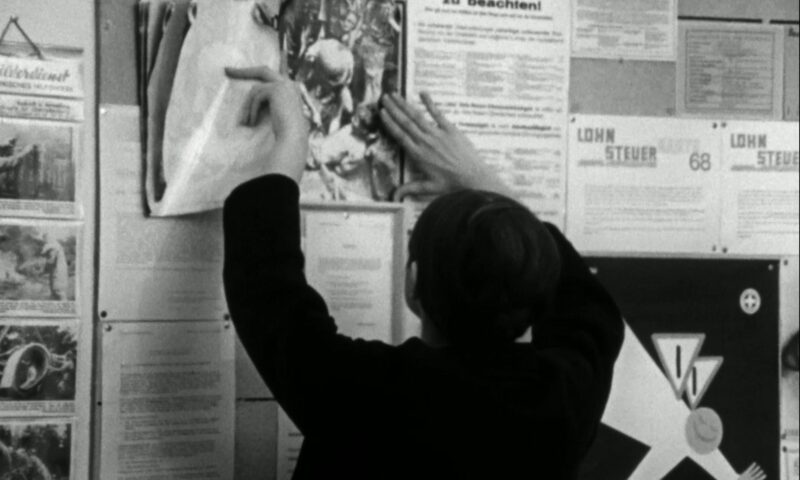 In these three recent films, A Model Family in a Model Home, Two Marxists in Hollywood, and A Glass House, Zoe Beloff returns to and resurrects the greatest exponents of dialogue between radical politics and radical aesthetics: Bertolt Brecht and Sergei Eisenstein. The pair come together in Two Marxists in Hollywood, which tells the very different stories of their paradoxical, and ultimately unsuccessful, aspirations to collaborate with the Hollywood film industry. But, as Beloff, points out: if their utopian projects ended in failure, “what if they did not [fail], what if their ideas were merely lying in wait for us?” As she interweaves the two men’s histories, anecdotes of their Hollywood experiences, with their theoretical principles, Beloff also interweaves visually and cinematically different levels of time. 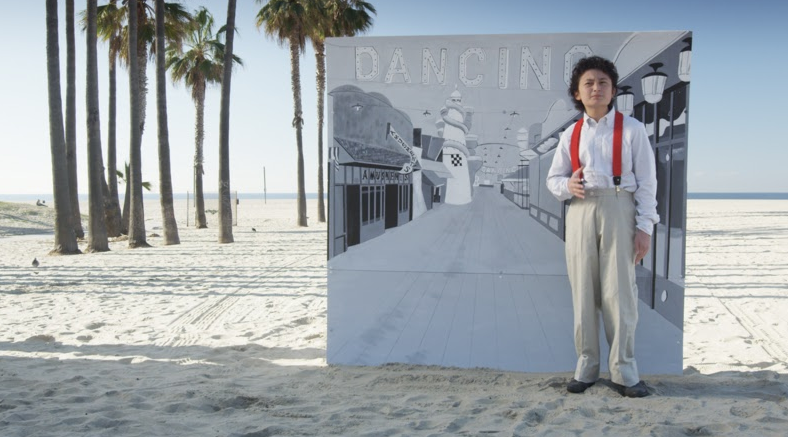 The film is shot in its Hollywood ‘now’ of 2015, emphasised by the presence of DJ Rapture in the soundtrack, but the ‘interviews’ with the two characters are played out against Beloff’s exquisitely painted backdrops of Hollywood ‘then’, also juxtaposing theatricality with the actuality of the locations. These distanciation-effects are accentuated by the casting of Brecht and Eisenstein as twelve-year-old boys. In Two Marxists in Hollywood, both Eisenstein and Brecht mention projects that were inspired by their time in the USA: Brecht describes ‘A Model Family in a Model Home’; Eisenstein describes ‘A Glass House’. Beloff’s film reconstructions of these ‘failed’ projects will also be screened as part of this special event. Both projects revolved around very different mediations of the politics of architecture, but, through Beloff’s films, they have found a dialectical relation to each other. In 1930 Russian avant-garde filmmaker Sergei Eisenstein spent six months in Los Angeles under contract with Paramount. A decade later German playwright and theatre director Bertolt Brecht, a refugee from Nazi Germany, lived there from 1941 to 1947. Both set out to make films in Hollywood on their own terms. Working in the world’s most famous factory of dreams, they believed that artists must call into question the way we understand our world. They wanted to make art that was both radical and popular. Fleeing from the Nazis, Bertolt Brecht arrived in Los Angeles in 1941. This film is inspired by notes for movie that he based on an article in Life magazine called A Model Family in a Model Home. It explores Brecht’s ideas about working people and the home as a stage upon which larger political and social forces are played out. A film based on Sergei Eisenstein’s notes and drawings for a science fiction movie that he pitched to Paramount Studios in 1930. Its theme is the architecture of surveillance. Zoe Beloff works with a wide range of media including film, projection performance, installation and drawing. She considers herself a medium, an interface between the living and the dead, the real and the imaginary. Each project aims to connect the present to past so that it might illuminate the future in new ways. Her most recent completed project is A World Redrawn: Eisenstein and Brecht in Hollywood. Through films, drawings, architectural models and archival documents, Beloff explores their unrealised film scenarios ‘Glass House’ and ‘A Model Family in a Model Home’ and reimagines their ideas for today.